Before we head into the winter season I thought I'd toss some nature photos - just a few. These images were taken without going out into the wild world of the natural habitat though...they were taken without leaving my yard. In one case, I didn't even get out of the chair at my desk. A few of the photos here are from my shy little garden or pond frog. This little guy grew in the small pond installed in my small front garden. Don't ask me how, because I truly have no idea. Last year when winter approached, we decided not to empty the water from the pond, so it froze over the winter. In the spring when the snow melted into the pond...the water was very dirty. I have plants around the edge of the pond (mostly vinca) that have grown over the edge and into the water, and have developed roots in the water. In mid-spring before we hooked up the fountain in the pond, I emptied the old water - at least, I emptied most of it, except perhaps for perhaps a couple of cupfuls in the bottom. I wiped the sides down and tried to clear out as much of sand (from the winter) as I could. When I stepped into the pond, the little bit of water sitting in the bottom had "things" swimming in it - I immediately climbed back out, thinking only of these being baby leeches. Apparently they weren't. We filled the pond and hooked up the spitting crane fountain and we were good to go for the spring to fall season. But not terribly long after that (probably sometime in late June), I noticed a tiny frog in the pond, just clinging to the sides. He was impossible to catch, diving down to the bottom of the pond, or slipping out of our hands as we tried. 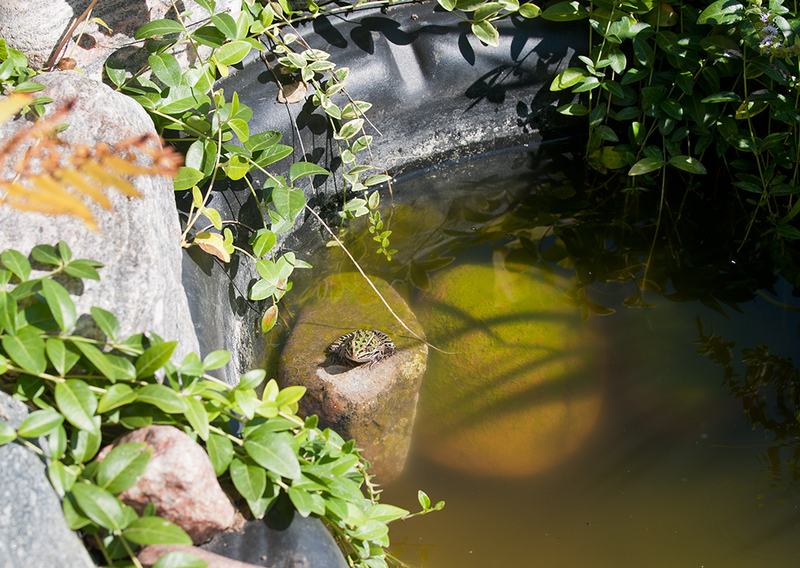 Occasionally we'd find him climbing up the water hose to the fountain to get out, or one of the roots hanging in the pond, so we put a few large stones in the pond near the sides for him. 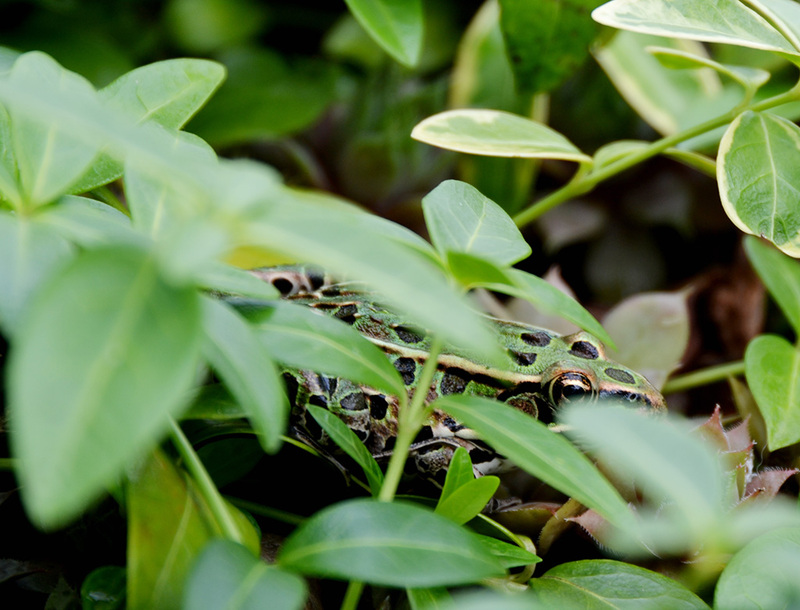 We'd find him in the garden, eating bugs, sunning on a rock or hiding in the foliage around the edge of the pond, but no matter what we tried, we haven't been able to catch him. We left him for the summer, but I'm a little worried about the poor little guy. 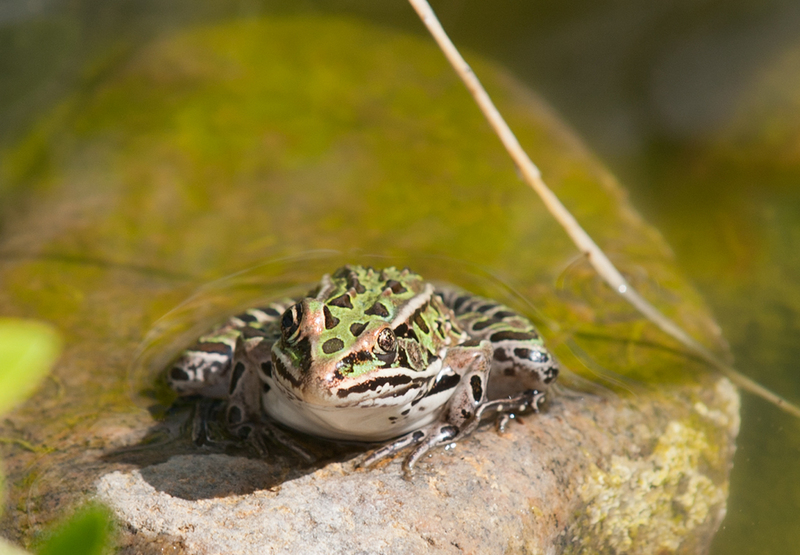 Typically, the frogs burrow under the silt or sand at the bottom of a pond or marsh to hibernate for winter, but we don't have enough of that for him to burrow...so I'm afraid I'll find him the spring, frozen at the bottom of the pond. 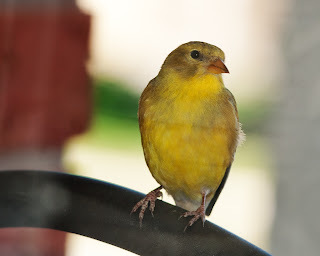 Another visitor to our yard stopped by my office window one afternoon...for what I don't know, but this little yellow finch perched on the top rail of a chair sitting against the window on the front porch. I watched it for a few minutes, and it didn't seem in a hurry to fly away as I moved around a little at my desk, and not even when I tapped on the window glass. I hastily grabbed my camera and fired off a quick shot - it's not the best quality since it's through the glass, but the finch sat for a few seconds more, before turning and flying off to the roof next door. I've mentioned in previous articles that we have a very small yard, and a very small garden at the front of the house - quite narrow, but full of perennials and spring bulbs. Each season, and each year, the garden looks slightly different, and this spring was no different. The plants are all the same, but some spread themselves by blowing seed (forget-me-nots) and so they appear each spring wherver the seed has taken root, and it's never the same as the year before. 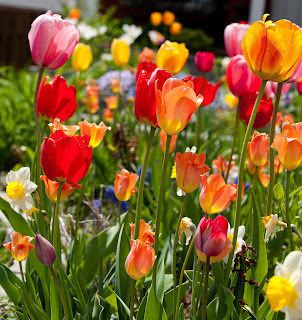 These bloom usually around the same time as many of the tulips, and some of the other low spring plants and creepers (vinca, creeping phlox). I love this time of the spring, and my garden is is always pretty in spring (well, at least in my eyes it is). 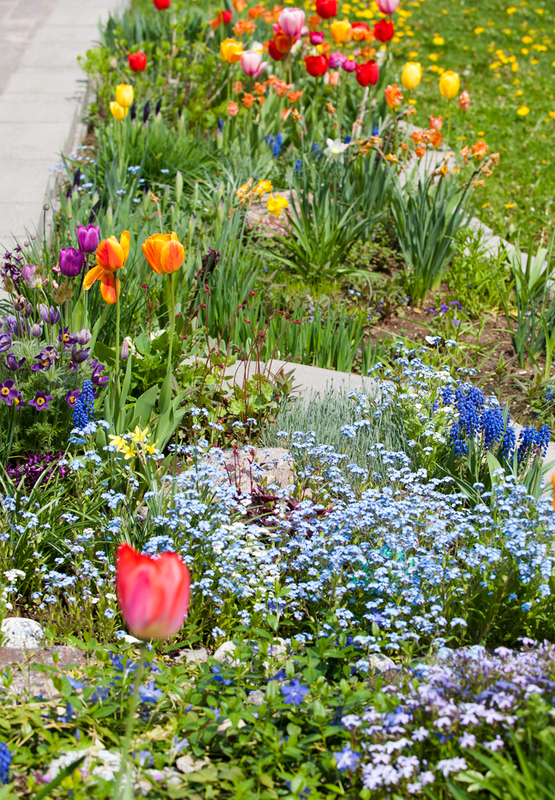 Summer plants are less exuberant, with more greens and flowering shrubs, but the spring is bold and colourful. The last couple of pictures aren't outdoor nature, but these incorporate some element from nature - a bunny, cabbage, autumn leaves and colours, sticks and various other bits of the outdoors. 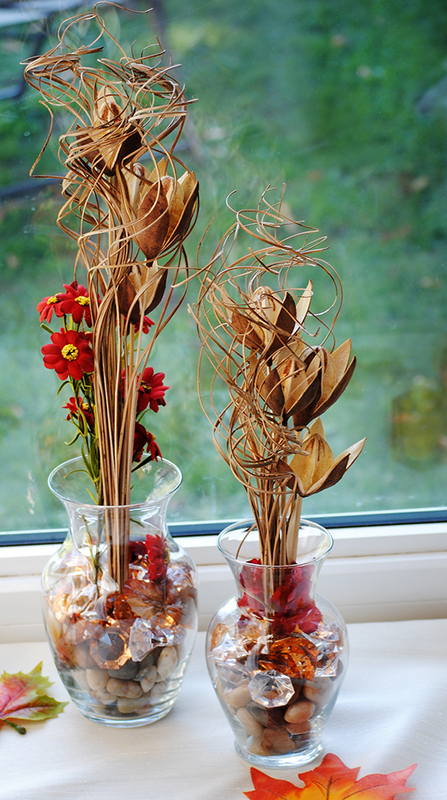 Decorative window displays in your home, or large pots of autumn leaves and sticks can make a pretty display. Don't be afraid to take pictures of things in your home that have a pleasing appearance - a vase of flowers against a sunny window can be useful to illustrate a blog article on home decor, or your thoughts about a sunny day. And the last little pic isn't really from nature - this little porcelain bunny with it's planter of cabbage. This belonged to my aunt, and for now it's residing in my house. 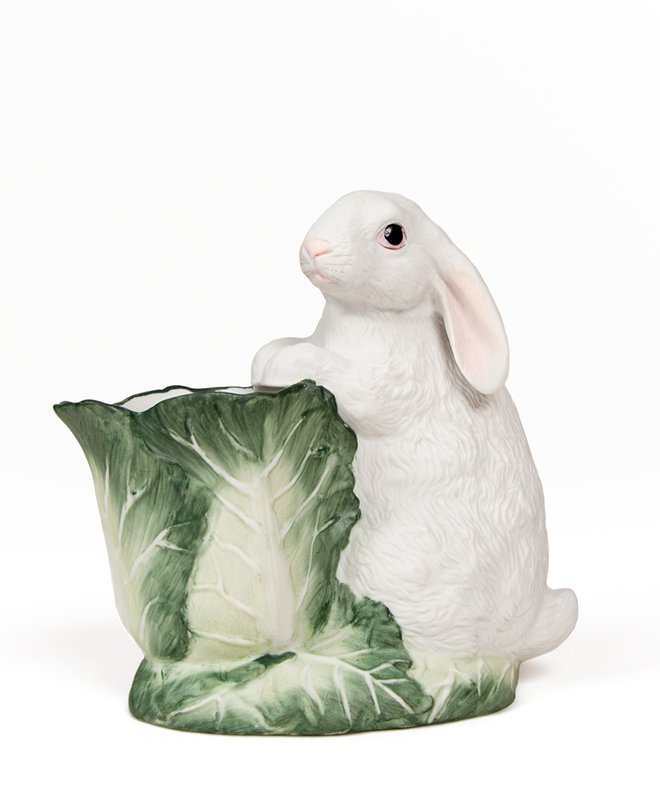 He's a delicate little guy, and has a matte porcelain finish, rather than a shiny-china finish...and somehow, there's just something about him that pleases the eye. Oops - one more! This funky looking dandelion. 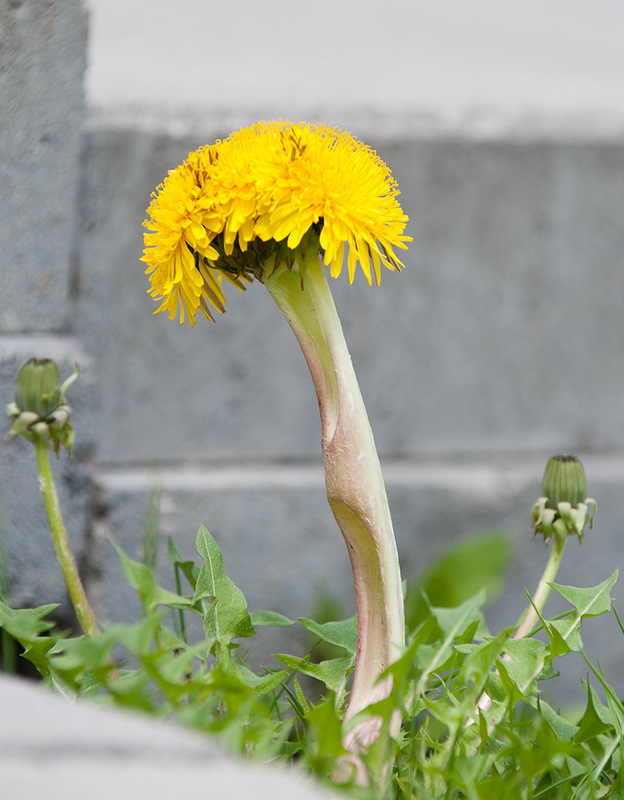 Now, dandelions are something most of us try really hard to avoid having in our lawns - I can't say we tried in the last year or two. We needed some excavating done in our back yard, and because we knew that machinery and equipment would tear up the bit of lawn we've got out front, we decided to forgo worrying about the weeds until the backyard was finished. It's mostly done now - a large new shed and a wood deck now take up most of our small yard. All that's left is a small pathway to finish at the side of the house, and get our new gate installed. Anyway, this year we had a crop of dandelions we couldn't really keep under control, though I dug them out of the lawn (by hand) regularly throughout the summer. The one is this picture was quite large - you'll note the oddness of it's stem...partly flat and partly rounded. 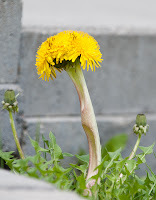 If you look at the flowering part, you'll notice that it has three crowns - this is obvious some deviant that probably should have been three dandelions, but grew into one monsterous one instead.